EDGER LAWN Rentals Ft. Collins CO, Where to Rent EDGER LAWN in Ft. Collins, Wellington, Greeley, LaPorte, Loveland, Windsor CO and all of Northern Colorado. 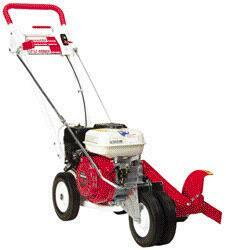 These wheeled edgers are designed to cut clean, crisp edges quickly and efficiently. They'll cut up to 90 feet per minute. Dual-belts provide extra power to the blade. They're user-friendly with fingertip controls and a ratchet-arm height adjustment system for fatigue-free operation and control. Eye protection is required while edging. * Please call us for any questions on our edger lawn rentals in Fort Collins, Wellington, Greeley, LaPorte, Loveland, Windsor CO and all of Northern Colorado.